Brewers love using refractometers for their ability to give quick, accurate readings with a small sample. Ease of use, digital read-out (easier to read and calibrate). I have completely shifted over to a Brix view of the world and would like to replace my refractometer with an easier to use instrument. I have had this for over a year & it has NEVER given a consistent reading. Any sample other than distilled water, at any consistent temp will give a different reading 9 out of 10 times. This POS has never been accurate or consistent. Biggest waste of brewing tech bnb I have ever spent. I've used this instrument on two brew days. 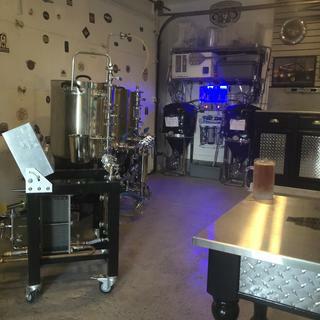 I typically batch sparge and like to take readings after each sparge. I also like taking readings during the boil. (Of course I let the sample cool before placing a drop in the sampling wel.) I am extremely happy with it. It certainly beats squinting through the eyepiece of a handheld refractometer, while trying to steady myself so that I can make out a precise Brix reading. With a handheld instrument, there is also the interpretive ambiguity of where the line actually is when it isn't sharp. The Hanna instrument gives robust repeatable readings as long as you initially wait a few seconds for temperature stabilization. I'm definitely happy with this purchase. Great review! Thank you for sharing your experience with this equipment. Works great, fast & extremely accurate. Would suggest this item to anyone who brews all grain beers. The precise ability to spot check your process is a real plus. Takes the guesswork out of the refractometer. Super easy to use. It works great but tet the sample cool a bit. Yes, it does account for temperature but I have found letting the sample sit on the glass for 45 seconds or so makes a significant difference in the reading and the final reading is more accurate (tends to be higher) when compared to a full hydrometer reading. I originally purchased this because of all the 1 gallon sour experiments I am working on. A small sample (such as one drop) is all you need to get a reading, which can be quite useful when you have a small volume to take a sample from. I always keep a fresh bottle of distilled water nearby to zero in the device, and it always seems to work perfect. After using for a couple of months, and tons of samples, the only bad thing about this Hanna refractometer are the necessary conversions (you have to convert out of Brix and Celsius). When I originally purchased this refractometer I didn't trust it completely, but since I've verified results with a hydrometer many times and any small variation in results I can only assume is from my variation in reading the hydrometer. If and when this goes out, I'll probably just have to get another so I don't have to waste time with a hydrometer again! Great - no more guessing! I love having my readings in clear digital numbers and with temp so I can adjust gravity appropriately. Super easy to operate and a great addition to brew day! I converted to refractometers a while ago, which I love due to their ability to measure small samples, which you can cool quickly. However, reading a handheld one, especially with glasses on, felt like an exercise in subjectivity. We would pass it around, trying to get everyone's vote. When I damaged it, I considered buying another. But I was at MoreBeer during a sale, and this was slightly less exorbitantly priced, and I decided to get it. I am so glad I did. This is so clear and consistent to get a reading. Let's cut to the chase; the only issues with this refractometer are the lack of internal conversion to Plato, Specific Gravity, or just plain ABV. It's very simple to calibrate and use repeatedly. The automatic temp correction takes guess work out of the equation. With a quick conversion table check, very accurate readings are at your fingertips! While the price is high, it is easily one of the best additions to the brewery and coupled with the ease of use, it really is an invaluable addition to the brewery. Easy and accurate gravity readings! This is a great product to ease any brew day. I can take gravity readings at pre-boil and post boil to ensure I hit my targets instantly due to the temperature correction on the device. The cleanup is extremely easy, two wipes of paper towels then put it away. I keep a Brix-SG conversion chart nearby so I can translate the readings to my brewing logs.